This past week, the NFL gave players the opportunity to support their causes through the third year of the My Cause, My Cleats campaign. 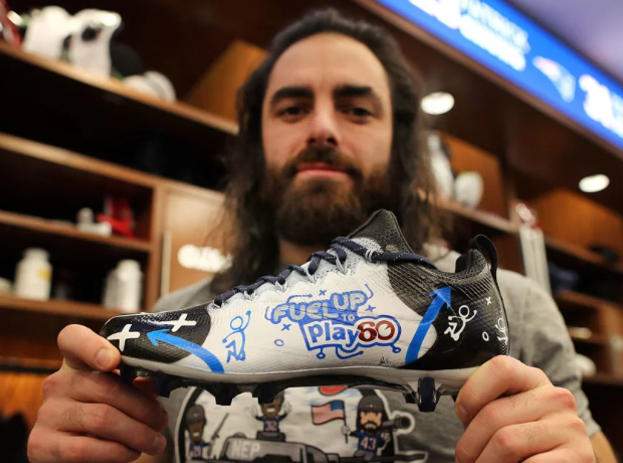 Unlike previous years, the campaign now allows players from all 32 teams to break uniform code during Week’s 13 – 15, and wear brightly-colored, customized cleats to show support for a cause important to them. Fuel Up to Play 60 (FUTP 60) was honored to have a total of four FUTP 60 player ambassadors support the program, the most that they have ever had. 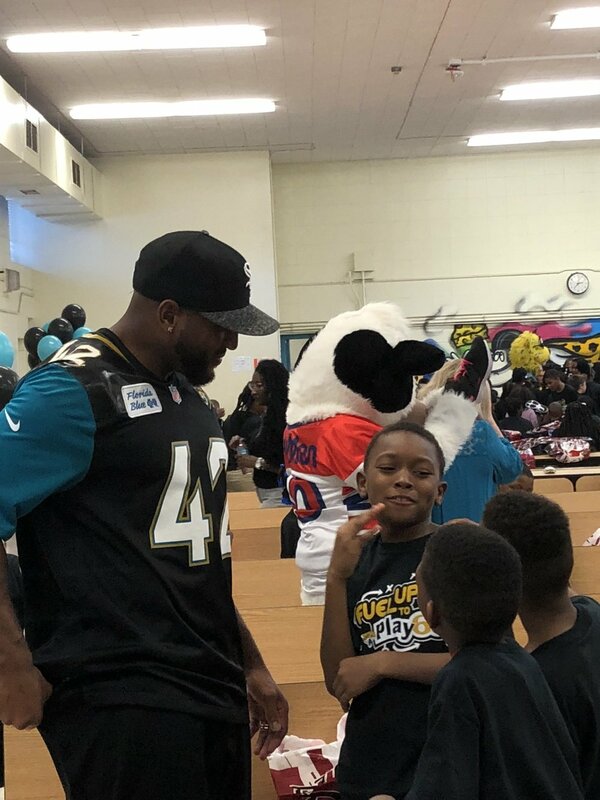 The FUTP 60 player ambassadors that supported the program this year included Barry Church (Jaguars), Nate Ebner (Patriots), Justin Simmons (Broncos) and D.J. Reader (Texans). Barry Church supported Fuel Up to Play 60 for the third year in a row. Barry has been involved with the program for over 4 years and previously played for the Dallas Cowboys where he served as their FUTP 60 player ambassador from 2015 – 2017. Barry will be unveiling his FUTP 60-inspired cleats at an appearance at the Jaguars stadium on December 11th. Justin Simmons supported FUTP 60 for the first time. Similar to last year with Broncos FUTP60 player ambassador, Virgil Green, Justin drew inspiration for his cleat design through a school contest Western Dairy Association ran in the Denver market which asked students to design a FUTP 60 themed cleat that Justin could use as inspiration for his own design. Justin selected the contest winner’s design and worked with a cleat designer to the design his own cleats. Nate Ebner and D.J. 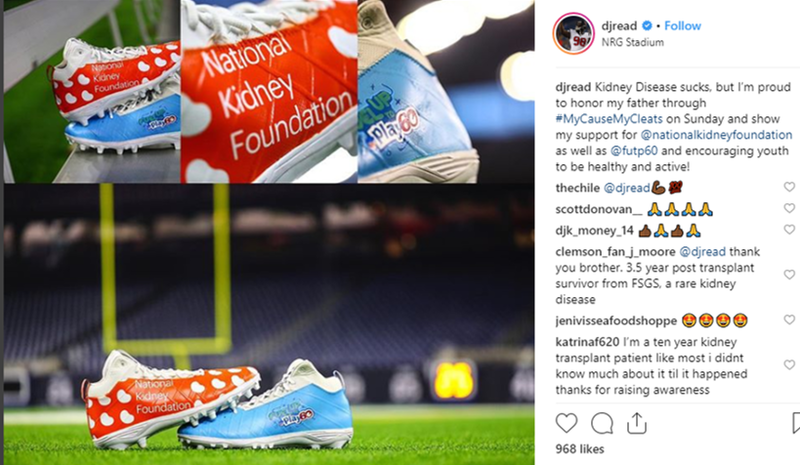 Reader, who are both new player ambassadors, supported the program for the first time and unveiled their cleats during their respective Week 13 games, which they won! The Fuel Up to Play 60 Student Ambassador Summit in Decatur, GA was an exciting event for Dairy Management Inc., Team Services' client, bringing together more than 300 students and adults to . Read more about the event in the latest blog post here. Over 300 Fuel Up to Play 60 Student Ambassadors and Program Advisors, representing 170 schools and 46 states, came together this past month at Agnes Scott College for the 9th annual Fuel Up to Play 60 Student Ambassador Summit. The week consisted of career exploration in agriculture, opportunities for project funding and special guests that spoke to the students about becoming leaders in their schools and communities. Attendees also had the chance to tour Mercedes-Benz Stadium and meet 15 NFL players and alumni as well as 6 team mascots, coordinated by Team Services. Barry Church of the Jacksonville Jaguars kicked off the Summit in welcoming students and Program Advisors with tours of the campus upon their arrival. The opening ceremony and Kickoff in the Quad were both full of NFL spirit with three alumni from the Atlanta Falcons running skills and drills, active player Ben Garland jumping in with the students and mascots dancing off against Falcons cheerleaders. Students and Program Advisors heard from Jason Brown, an NFL player turned farmer, alongside dairy farmers in a panel on agriculture and farming careers. Jerome Bettis, a former Steelers player, Matt Bryant of the Atlanta Falcons and David Johnson of the Arizona Cardinals all came together with the students and NFL Commissioner Roger Goodell to celebrate the NFL’s support of FUTP 60. Goodell spoke of the importance of the program, leadership and the value of maintaining a healthy lifestyle. To close out the week, Program Advisors were recognized for their support of FUTP 60 at a dinner with Alex Smith of the Washington Redskins and parents were given the opportunity to join their kids for breakfast with Graham Gano of the Carolina Panthers. For more information, check out the social media feed on www.FuelUpToPlay60.com or the hashtag #FUTP60Summit. As the sports marketing agency of Dairy Management Inc. (DMI), Team Services continues to strategically negotiate and activate DMI's partnership with the NFL. Team Services works with DMI's local state and regional dairy associations to activate Fuel Up to Play 60 (FUTP 60) through its NFL clubs and player ambassadors. Team Services negotiates all player endorsements and club partnerships on behalf of the National Dairy Council. For Joseph Bramlett's entire professional career, Team Services has had the privilege to represent him in his dealings both on and off the golf course, maintaining his relationships with both the PGA and Web.com Tours as well as his partnership with Nike Golf. Now sitting 21st on the Web.com Tour money list, Team Services is proud of the perseverance he has shown not only this season but over many years. As the Web.com Tour navigates nine consecutive tournament weeks to conclude the Regular Season, several players opt to take off-weeks here and there, to conserve energy as they make late-season pushes for spots in The 25 and resultant PGA TOUR cards. It’s a combination of travel, range work, learning new courses, learning new cities. A week off can freshen the body and mind for what’s to come. Joseph Bramlett’s attitude is a bit different, though. The Stanford alum spent the majority of five years away from competitive golf, battling severe back pain and weighing the pros and cons of potentially career-ending surgery. After years of investigation, a stability-centric swing change has allowed Bramlett’s back to withstand the rigors of a Tour season. The 30-year-old is navigating his first full schedule since 2012, and his game is peaking in the summer heat, with five consecutive top-16 finishes leading into this week’s Price Cutter Charity Championship presented by Dr Pepper. The California native has been a picture of consistency this season, with 14 made cuts in 15 starts, moving to No. 21 on the money list as he strives to put a bow on his comeback story. The energy is fresh, and it’s real. “I’m not going to say I’m not tired, and that there aren’t days where I’m fatigued, but mentally I’m really excited to be playing,” Bramlett said Tuesday at Highland Springs CC. “I think the stretch that I’ve been out has really refreshed me, and it has lit quite a fire under me, to try to get back out there (to the PGA TOUR). “I’m very excited, and I don’t feel like I need a break." The former Stanford standout earned his PGA TOUR card right out of college, via the 2010 PGA TOUR Qualifying Tournament, but finished No. 199 on in the 2011 FedExCup standings to lose his card. It’s unlikely he would have, or could have, anticipated the road he would face in chasing a TOUR return. After a solid 2012 Web.com Tour campaign (No. 28 on the money list), Bramlett’s world changed at the 2013 Utah Championship presented by Zions Bank. While working through a standard range session, his back went out, leading to pain so severe that he was relegated to lying on his back for hours at a time. Bramlett traversed across the United States, visiting more than a dozen surgeons in search of an answer, with some telling him that his career might be over. Surgery could help him live pain-free, day-to-day, but could significantly reduce his capabilities of competing at the highest level. A combination of targeted exercising and swing changes kept the pain at bay and allowed him to attempt a Web.com Tour return in 2016. He played three events, but the pain got progressively worse, and he was forced to step away once again. The course has led to consistent play in 2018, where his body has held up for the majority of the season. Several players choose to take off-weeks to conserve energy, but Bramlett is making his sixth consecutive start this week in the Ozarks. “My body has been able to hold up,” Bramlett said. “I’m talking with my physical therapist every night on the phone, and my coach is out here this week trying to make sure that we keep things set and solid. As Bramlett thinks back to his “low point” in March 2017, when he considered experimental surgery before those around him talked him out of it, the opportunity to chase a spot in The 25 is one to embrace. He says he’s been knocking off rust throughout the season, and justifiably so, as he made only three starts in a 55-month period between July 2013 and February 2018, where he placed T27 at the Panama Championship as he began his second comeback effort. It would appear that the rust is mostly off. In Bramlett’s last 10 starts, he has only twice finished outside the top 16. He ranks third on Tour in birdie average, fourth in greens in regulation and fourth in total driving. His game is in one of the best spots it has ever been. With $152,493 in season-to-date earnings, though, he knows the mission is not yet complete. Bramlett’s succinct plan as he strives to secure his place in The 25 over the next four events? Chase trophies, and the results will take care of themselves. “If I were to stop playing right now, I wouldn’t get my TOUR card,” Bramlett said. “I wouldn’t make enough. I have to keep going. It’s great being No. 21 on the money list, but I still haven’t won a tournament this year … I haven’t even finished in the top three. “I feel like I’ve had a consistent year; I’m encouraged by the progress I’ve made with my game, and I lot of my stats are grossly improved from when I last played out here. “I want to win, and I haven’t won. I know if I do that, everything else is going to be in really good shape." Bramlett is back to speaking in golf terms, rather than medical terms. And it feels good. As the sports marketing agency for Dairy Management Inc, Team Services coordinates DMI’s involvement at the NFL Draft each year, providing unique opportunities to students involved in the Fuel Up to Play 60 (FUTP 60) program and assisting with onsite activations with students. As the exclusive sports marketing agency for Dairy Management, Inc., Team Services is tasked with providing first class entertainment to DMI, DMI's board members and guests each year at Super Bowl. Team Services' principal, EJ Narcise, was quoted in Milwaukee Business Journal's article "How late in the game are the Bucks in their arena naming-rights deal?" by Rich Kirchen. Privileged to represent Joseph Bramlett in his dealings both on and off the golf course. We are excited for Joe’s Web.com Tour season and his continued progress in making it back to the PGA Tour. Meet Consulting intern Moses Anoh and how he's now even closer to his dream job!